Trump: Carly Fiorina Is Too Ugly To Be President - Joe.My.God. In an interview with FOX News on Thursday morning, Trump did not dispute the quote but said that he made the comment in a “jocular manner” and that he was referring to Fiorina’s “persona.” “Probably I did say something like that about Carly,” Trump said. “I’m talking about persona. I’m not talking about look.” Trump also implied Thursday morning that the media reaction to his comments about Fiorina betrays a double standard. “When I get criticized constantly about my hair, nobody does a story about ‘Oh isn’t that terrible, they criticized Donald Trump’s hair,'” he said. Fiorina responded to the remarks on Kelly’s FOX News show late Wednesday night. “Maybe, just maybe, I’m getting under his skin a little bit because I am climbing in the polls,” she said. 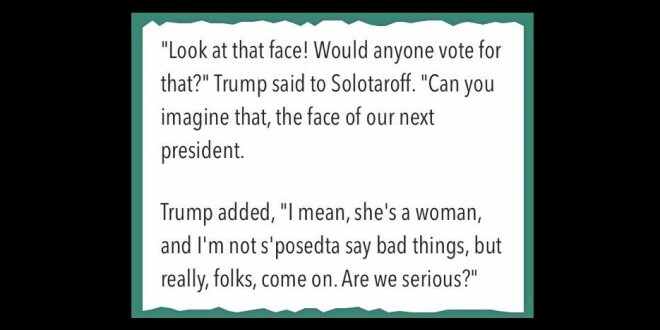 Trump is no stranger to comments deemed offensive to women. He engaged in a prolonged war with FOX News this summer after appearing to suggest that host Megyn Kelly was menstruating during the first GOP debate. Expect Trump’s poll numbers to climb even higher after this.